The cello is experiencing a bit of a renaissance right now, and deservedly so. The instrument has been around for at least 500 years, although it’s changed a great deal from its original design. 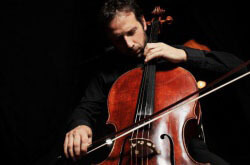 The cello is an amazing instrument, capable of performing multiple musical roles, and this versatility is the reason its rich tone has crept into almost every musical genre. Why should you play the cello? We dare you to listen to the Prelude to Bach’s first cello suite and not want to pick one up. 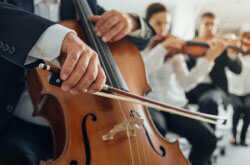 There is no orchestra, chamber group, quartet, or trio without the cello. The same can be said about the violin and viola, but the cello fills a unique roll. The cello balances out the loud, high pitch of the violin section, bringing the music back down to earth. Playing cello means you get to play almost every part in the orchestra: the melody, harmony, and bass line, often all in one piece. 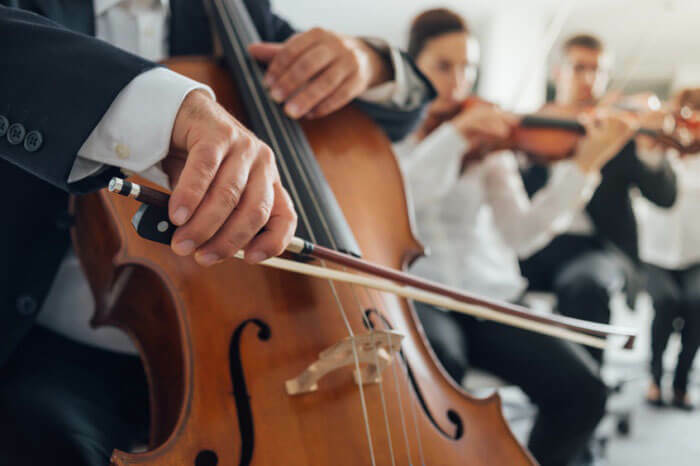 While the famous (…infamous among cellists) eight notes that make up the bass line of Pachelbel’s Canon might come to mind when thinking of ensemble cello performances, there’s a whole lot more music out there for cellists. Beyond orchestral works you should check out Boccherini’s cello quintets, including Opus 10, La Magnifica Comunità. Many cellists have entire careers doing ensemble work, playing at events like weddings to make money, and never play in orchestras. There is always a demand for good ensemble cellists! Even if you’ve never touched an instrument in your life, been to a classical music concert, or sought out classical music you’ve heard the Prelude to Bach’s first cello suite. It’s in movies, commercials, tv shows, and probably playing in the background at your favorite coffee shop. This piece is the definitive cello solo. Learning the Bach Suites is a major milestone in every cellists’ study, and many can tell you that the first time they could perform the Bach Prelude was the moment they realized that they had truly honed their talent. There’s so much more to cello than the Bach Suites. The list of great cello solos could go on forever, almost every major composer wrote pieces for cello. Jaqueline du Pré, one of the most famous cellists in history, completely owned Elgar’s Cello Concerto in E Minor. Du Pré’s performance of the concerto has gone down in history as one of the greatest performances of all time. Few artists have been better at portraying raw emotion the way that du Pré was. To hear her play is to understand just how incredible the cello is. One of the most incredible things about the cello is that it can become every string instrument in the orchestra. 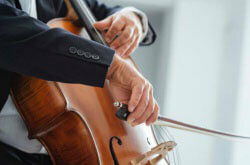 The cello’s size, while big to some who’ve never played, means it can play in three clefs: bass, tenor, and treble. You might even play in all three within one piece. There’s no limit to what you can interpret and learn. Playing in multiple clefs can definitely be a challenge, but it becomes second nature over time. Cellos can be almost unrecognizable in certain parts, their sound being easily transformed. Being a musician is amazing for your health, both physically and mentally. Numerous studies have linked playing an instrument and improved school performance. Additionally, playing music can have long term benefits on your memory. People don’t often consider the physical strength that develops from playing the cello. It requires good posture and strong back muscles, strong arms, and strong hands. You’ll surprise yourself with the amount of strength you develop with regular practicing. Also, you’ve got to stay in pretty good shape if you’re carrying one around all the time! Additionally, as most musicians can vouch for, playing any instrument is good for your mental well-being. It’s a physical release through music of whatever emotions you’re feeling. Boss was unbearable at work? Go play some Shostakovich. Sad? Bach’s second and fifth cello suites are there for you to let it all out. There is no greater feeling in the world than pouring your heart into your instrument. This argument might sound a little biased, but there’s some good evidence to back it up. The cello has a special sound. Not as whiney as the violin, not too low like the bass, but deeply layered and rich. People have compared its sound to the human voice for centuries, which is probably why it sounds so appealing to our ears. The reason behind this is because the cello’s range is quite similar to a person’s vocal range. Its wide range means it can really sing. Just listen to Saint-Saens’ The Swan. The cello is like a method actor, and it can take on any role. Saint-Saens’ is able to make an instrument truly embody a swan. 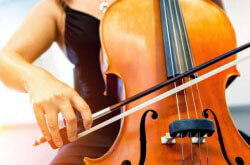 The cello’s complex tone allows it to become the music. The physical demands of playing an instrument eventually become too much. A wonderful thing about the cello is its ease of playing – holding it is a lot easier on your body than a violin or bass. While eventually we might all become too old to play, you see cellists playing regularly for years longer than other musicians. The great Mstislav Rostropovich didn’t stop performing until 2005, at 78. Pablo Casals played into his nineties. There’s no retirement age for being a cellist. The music world is fiercely competitive. There isn’t an instrument out there that is “easy” to play professionally, but there are definitely ones with slightly smaller professional communities. It seems like everyone played violin for a couple of years at a young age, often giving it up when their parents let them. Getting an orchestra position as a violinist can feel impossible. Cellists face intense audition processes as well, but pale in comparison to the sheer number of violinists out there. There’s definitely a little more room for a good cellist in the world. Being a cellist is an identity. Meeting another cellist is an immediate ice-breaker. Within the music world every musician jokes about different personality types for different instruments. Whether or not you fit the mold it’s fun to have a sense of belonging. When people ask you if you play an instrument and you tell them you’re a cellist they’re often surprised. Your talent is memorable. It makes you a little bit more intriguing. You get a great sense of pride from your instrument. Other musical genres have always utilized string instruments beyond the guitar and piano, but their go-to has become the cello. The cello accompanies singers in such a complementary way. The Beatles’ were some of the first to heavily feature the cello, most iconically on Eleanor Rigby. Since then numerous hits have featured cellos, including Oasis’ Wonderwall and Apologize by One Republic. Game of Thrones’ awesome opening theme is another great one, and the Piano Guys on YouTube have taken the cello into styles and genres that nobody had previously interpreted. There’s even an all-cello metal group, Apocalyptica. Yo-Yo Ma has frequently crossed over into popular music, working on the soundtracks of numerous major films. The group 2Cellos have become the rock stars of the cello world, mixing brilliant interpretations of classical pieces with pop songs like Smooth Criminal by Michael Jackson. Have you always wanted to be in a band? Go on tour? Being a cellist opens those doors for you. It’s a common misconception that playing a classical instrument means you can only perform classical music. You can develop an entire career without playing another concerto, if you wish, although we doubt you’d want to! Playing a huge catalogue of diverse repertoire is one of the greatest joys of being a cellist. To conclude, there’s no doubt that once you pick up a cello you’ll never want to put it back down. There’s a certain thrill that comes with being a musician. People don’t understand what an emotional, sometimes wild experience playing music can be. It will enrich every aspect of your life. Don’t be intimidated by the process of starting from scratch, every artist has to earn their abilities. If we haven’t managed to convinced you to pick up the cello, nobody can. So what are you waiting for? Don’t worry about buying an expensive instrument from the start – there are endless resources for renting instruments no matter where you live. We suggest finding a rental and once you get serious consider buying your own. There’s nothing like the bond you have with your cello!